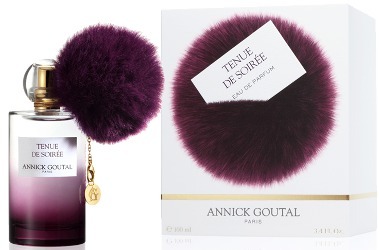 The pompom and charm on Tenue de Soirée is detachable, so you can use it as a key ring or as an accessory on your handbag, if such is your wont, and the chypre gourmand fragrance was inspired by the "the anticipation of a special event and the prospect of a night in Paris".2 To match the pompom, perfumer Mathieu Nardin has developed a fragrance that takes the elements of fun, quirky and young that you might expect to smell from mainstream fragrance brands and classes them up a notch — you might think of Tenue de Soirée as a bridge between your worst gourmand / fruitchouli nightmare and the more elegant cosmetic powder / lipstick fragrances from your favorite niche brand. So we have a gourmand built around iris, patchouli and plenty of fruits, but Nardin has left out the neon-pink bubblegum (Dior Poison Girl) and cherry coke (Guerlain La Petite Robe Noire), instead going for a relatively sedate plummy-berry mix that echoes the purple of the pompom. There's a sheer (but briefly sharp) heart of nondescript florals, and there's a good dose of sugar to be sure, but it's not at defcon sillage levels (Lancôme La Vie Est Belle or Viktor & Rolf BonBon), in fact, Tenue de Soirée is rather quiet once the top notes relax. The iris makes itself known from the opening, where it serves to keep the fruits tamped down; both the iris and patchouli are middle of the road: some warmth, a little creamy and a little powdery, but not too earthy and not too clean. Verdict: The 'quirky' is all in the pompom, but Tenue de Soirée is well done.3 It's youthful without being obnoxious or silly, and it's reasonably sophisticated, and quite wearable. If you like the idea of a gourmand fruitchouli sort of thing but find most of them too loud to wear, it is certainly worth trying. I am not sure its target market will find it fun enough — if it did not bother me to wear it, most probably they have not quite hit their mark? The prices have gone up a tad, but they've added a 30 ml size, so that does help ease the pain. I will miss the classic ribbed bottles and bows, though. Annick Goutal Tenue de Soirée is available in 30 ($80), 50 ($125) and 100 ($190) ml Eau de Parfum. 1. Quotes and other information about the brand changes are via "Annick Goutal to Re-brand, Launch Tenue de Soirée", at Women's Wear Daily 10/12/2016. Fans might be interested to know that there are around 45 scents in the catalog at the moment, so if there is something from Annick Goutal that you love, yes, it might be time to worry, and that's presumably especially so if your favorites are not the big sellers. 2. Via Annick Goutal introduces a new chypre gourmand fragrance at Cosmetics Business. 3. Arguably more quirky fragrances from Annick Goutal range from Folavril to Mandragore. Cat Deluxe by Naomi Campbell also have pompoms attached to the bottle! At least I’m all stocked up with vintage if they ruin everything. If I loved any of the older scents, I’d definitely stock up now. I need more Quel Amour! . Ninfeo Mio here I come! It would be really nice if they would just tell us which 20+ will stay. I suppose it would be too much to hope that there will be a 30ml option on the entire line, what remains of it? But yes, hug your vintage bottles. I’ve been meaning to sample Sables, so I’d better hop to it. I do not know the answer to that, sorry! I only know that the smaller size (smaller price, really is the point) is part of their strategy to attract young people. But am I crazy, aren’t they already old hat? I mean, I know they’re still in use but that’s 2014 / 2015, right? TdS is nice, but it just seems like it’s at the tail end of too many trends. I thought that too ax I read your review, but if the brand is re-shaping itself, surely they would be confident in their marketing strategy? They must believe that there are more dollars to be squeezed out of the LVEB trend? Puzzling. The new CEO at Goutal came from Parfums Givenchy. That’s ominous. Givenchy used to be so wonderful, then in the past few years have taken a nosedive into dreck. I knew that Goutal wasn’t moving in the direction that I would wish it to and this confirms it. Apparently Isabelle Doyen is no longer working with them? I’m glad I’m very well provided with Goutals, and will continue to love those creations. I’ll pass on this one, even though I do want that Pompon. Doyen did not do the last 2 regular scents (this one and Rose Pompon) but she did do Rose Oud. I don’t know what she’ll do in the future. Thanks for the info. In a way I’d rather Doyen left, but I know perfumers have very little say in what they develop anyway. I do feel sad though that this is happening. It used to be one of my favourite houses. Nothing lasts forever though. Nooo Eau du Sud don’t leave me! Yeah. Then again, I’ve been avoiding smelling a new version. Oh thank you for the heads up on this, Robin. I had better get cracking on securing my backup bottles of Songes and Petite Cherie. I find it really hard to believe that Petite Cherie would get axed! Songes, no idea. Plenty of Songes at the discounters (one less, because I just bought a bottle), and that makes me wonder. Im not familiar with the line. What do you all think one should sample before the ax falls? For myself- I love roses, Tuberose, Gardenia, Sandalwood and jasmine. -Dislike cedar, leather, incense, most orange blossom and Amber. Why not wait then, instead of falling in love with something discontinued? In all truth, many of my favorites from AG are already gone. But I do like Mandragore and Ninfeo Mio, and I liked Eau du Sud but suspect it’s been reformulated. Some older favorites that I think they don’t make anymore are Fier, Folavril and Chevrefeuille. Robin that’s a very sensible approach. Why indeed? thank you! If you love jasmine and gardenia, you should definitely try Songes. They have several roses, too. Thank you nozkoz. I probably ought to be sensible, and just wait and see what they keep. I do love the bottle and the pompom. So cute! I don’t see myself getting it though because I still have a strong “dislike” for iris – but I’m trying. But, I still need to try Ninfeo Mio……its been on my list for a while. I need to get on that ASAP. If you don’t like iris I doubt you’ll like this one. But I guess you never know! I’m not sure but Even without a pompom, it has a great bottle. It did not ever have a pouf so far as I know, just a pump atomizer. This seems to be part of a trend: really simple bottles like these cylinders, even for “Exclusive” lines. Since we are no longer a throw-away society, a more interesting bottle would be more desirable to keep and collect. Otherwise, empties this boring (minus the pom-pom)will just have to go in the recycling box for glass. I’ve managed to put off buying Hugo Boss Woman whose juice I like because the bottle is SO boring! So it’s a toss-up: do we by a fragrance we love for its bottle, its juice, or the Holy Grail, both? It is a trend, and I assume that means keeping your own custom bottle shapes has become more expensive? Whatever the reason, it does seem to be a trend. I think that their new bottles look mainstream and sort of boring. The pompom doesn’t do much for me. The original bottles are so beautiful and special. They make the most elegant sound when I remove the cap. You’d think that they would work on the juice more than the packaging? I have a feeling the look of the old packaging is too old fashioned (and maybe, too girly?) for the kind of consumer they want to attract. As someone who is very likely the target audience for the rebranding, I’ll agree that the old packaging (while lovely) doesn’t suit millennial tastes. It’s not embellished enough to appeal to a “vintage” or “authentic” theme, and it looks like they’ve gone the other direction toward minimalistic clean lines. And so do you like the bottle & pompom? I think the pompom is really funny, I’m pretty sure it’s more likely to end up a cat toy than an accessory! The bottle itself is pretty enough, but doesn’t have any personality like I’m used to seeing in higher-end perfume packaging. ps. sorry about the very late reply! You’ve echoed my thoughts exactly! According to Fragrantica, AG’s first collection launched in 1980, so that’s nearly 40 years of excellent perfume. Sad to see it go. It was my first niche line, and I’d still include some of the fragrances in my ever-elastic top ten. From the opportunistic or enabling point of view, more bargain bottles at the discounters! I tried several Goutals when I first fell down the rabbit hole. I bought a bottle of Eau de Camille but sold it because I never wore it. Is there any you recommend? I’ve tried HE but was surprised that I didn’t love it. I own have a 15 ml mini bottle of Songes but sort of gave up on testing this line. I like both Songes and Heure Exquise. I also own Passion, Ninfeo Mio, Nuit Etoilee, Mon Parfum Cheri par Camille, Eau du Sud, and Vetiver (which is my personal favorite vetiver). I have small bottles of a few others, but the ones I’ve mentioned are the ones I like the best, in no particular order. I also have Myrrhe Ardente but someone mentioned that it reminded them of root beer, which sort of spoiled it for me. My two favorites are also Songes and Heure Exquis! Another line bites the dust. Getting tired of everything trending “younger,” since I myself am not. You’ve hit it right on the head. I know the feeling, but do give it a try, maybe you’ll love it! It really isn’t *entirely& out of line with what they used to do. Folavril, when it launched, was probably quirky young & fun! And you could make a similar argument for Eau de Camille & Eau de Charlotte. This sounds like it’s worth a try! I don’t care for the bottle shape and phooey on the pouf. The ombré coloring style is young trying to be hip and the color reminds me of heavy velvet curtains; all these to say I am puzzled by the aesthetics and the supposed target audience. So, young, but not the same audience as Poison Girl. No, more sophisticated than that; a young urban professional with money to spend. I am a little reassured by that ad. It suggests a target market not that different from the market Annick Goutal aimed for when the brand got going (except that then it was a niche brand and you had to seek it out). I actually like the bottle and the color scheme, though I’m no millenial. I didn’t like the juice that much, however. I thought it fell between LVeB and L’Instant de Guerlain. I didn’t find it overly sugary sweet, so that wasn’t it, but I found something about it cloying. But I would prefer to smell this on the street over some other sugar bombs. Well then, I’m grateful for the many years I had of the real AG – Eau de Camille especially, & the original Eau de Ciel – plus the many samples of their others from way back (Folavril, Charlotte, Sud, Hadrien) kindly given to me with purchase by SAs both here (Liberty, Harvey Nicks, Harrods, Selfridges) & in the USA (NM, Saks, Nordstrom). On another bum note, I mentioned recently I had planned to pop into a shop called Uncommon Finds in Tampa next month, when I’m visiting my brother in the area. Had some lovely email to & fro with the shop owner, delightful guy called Rob, who told me he was closing his current location a couple of days before I travel & opening his new one the day after I arrive home! Talk about bad timing…so in view of the fact I haven’t been able to locate any other independent shops there I will have to make do with the fragrance departments in NM, Saks & Nordstrom (no Barneys New York in the area, which I find has a tad more interesting offerings than the other aforementioned department stores). Obviously I’m still looking forward to my trip, but it won’t be quite the same (says she from a particularly selfish but perfumed point of view!). Even if Annick Goutal were still alive, she would face the same economic reality! Hard to say what the brand would be like, but it might be exactly the same. So I hate to say the “real” AG is disappearing…to my mind, they’re doing a better job of respecting their heritage than many, including Guerlain. When I read this article, I thought to myself, this is how you destroy a company. I understand that they want to take it into a different direction, sure, rebrand your company image, but why redo a whole house from scratch? I hope what they mean by renaming the house is just by changing it to Goutal, ala Chanel, Dior, Balenciaga, etc. …what the heck are they going to do? Sounds like they’re taking the cow to the butcher and then when they get home, put it in a blender. Goutal would make sense, and it was my first guess. Anything else would be crazy. “Annie G” sounds cool, huh?